Air Ratchets are designed to make work easy for anyone who has ever had to fasten bolts that are hard to reach. With the best Air Ratchets, you not only manage to save time, you also save energy as they require less effort to operate heavy duty tasks. You can easily avoid greasing and bruising your way through maintenance and repair projects by picking the right one for your needs. But with so many options available, how do you pick the best? Well, check out our list and buyers guide to find out more. What is the Best Air Ratchet in April, 2019? Ingersoll-Rand 109XPA 3/8 inch 300 rpm 76 Ft-Lbs Check price! AIRCAT 805HT 3/8 inch 180 rpm 130 Ft-Lbs Check price! Ingersoll Rand 170G 3/8 inch 170 rpm 55 Ft-Lbs Check price! Ingersoll Rand 2025MAX 1/2 inch 7,100 rpm 180 Ft-Lbs Check price! AIRCAT 802-5 1/2 inch 280 rpm 70 Ft-Lbs Check price! Chicago Pneumatic CP886H 1/2 inch 160 rpm 50 Ft-Lbs Check price! Most of the time, when you get a budget air ratchet, you usually get an unreliable tool that is rarely built to last. Thankfully, that is not the case with Ingersoll-Rand 1-9XPA. Although it comes at a premium price, it boasts of an impressive torque of 76 ft-lb at speeds of up to 300 rpm. And, it is an air ratchet designed to take a lot of abuse thanks to an ergonomic grip with an adjustable exhaust for quality performance. You can expect quite powerful results from this air ratchet. It comes with an advanced head design to protect against slippage and separation. This air ratchet is also easy to use thanks to its push-button throttle. And, as one of the safest air ratchets on our list you will find it handy especially if you use it on light to medium duty tasks. The only downside is the fact that some users find its size and weight unsuitable for tight spots that are hard to access. However, if you are working with bolts that are easy to access this air ratchet might be a good choice. Torque: 60′ lbs., 10′ lbs. Granted, Ingersoll air ratchets can be quite durable and efficient, however, when it comes to less noisy air ratchets, AIRCAT takes home the crown. The reason is simple. The AIRCAT 805HT runs an impressive 84 decibels while its rivals produce noise in the 90-decibel range. Plus it comes with contoured comfortable grip design that makes it easy to adjust and move between the variable speeds with the trigger. 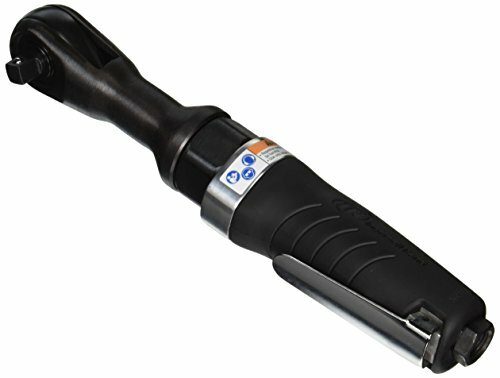 With a 2 year warranty, you can expect some durable performance with this air ratchet that boasts of a 130 ft-lbs of torque. Performance wise, this air ratchet makes a solid pick for those who prefer a quiet workspace with minimal ear protection gear. But even with its less noisy design, you would be wrong to assume that this air ratchet is less powerful. It is made with a reliable single pawl design that delivers a powerful performance. Furthermore, its design eliminates spreading and is ergonomically built for comfort no matter the task at hand. Ingersoll Rand 170G presents one of the best values for money for those looking for an affordable but durable air ratchet. The grip it offers is quite comfortable with an ergonomic design that delivers exceptional torque accuracy that is great for achieving safety while working on your projects. Weighing only 2.6 pounds, this air ratchet wrench is rugged with a TwinPawl design that is heat treated for durability. At speeds of 170 RPM, a 55ft-lb Torque, and a 3/8 inch drive size, this air ratchet is one of the best performing air ratchets at its price range. Made by an award-winning manufacturer, it boasts of a sturdy lightweight construct that delivers a powerful torque with optimal speed performance. Most users like it for its reliability especially with lighter automotive jobs as it can be handy in tasks such as timing chain replacement. The rubberized handle provides firm quality grip for comfort while working. However, you might need to pick another air ratchet if you need to work with larger bolts or if you need a lighter air ratchet for the job. Measuring about 14 inches long, Ingersoll Rand 2025MAX is a decent pick for those looking for both power and speed. It offers professionals innovative features that deliver great control for maximum power. With a maximum torque of 180 ft-lb and speeds of up to 7100 rpm, this air ratchet wrench has a feather touch trigger for precise control. As most users have come to expect of all Ingersoll Rand air ratchets, this one does not disappoint. It can be a handy tool especially if you are working around tight spaces that are hard to reach. It operates at 90 psi and you can turn your regulator on your compressor to check the dial if necessary. On average, it can consume up to 3.5 cfm of air and has a minimum hose size of 3/8 inches. 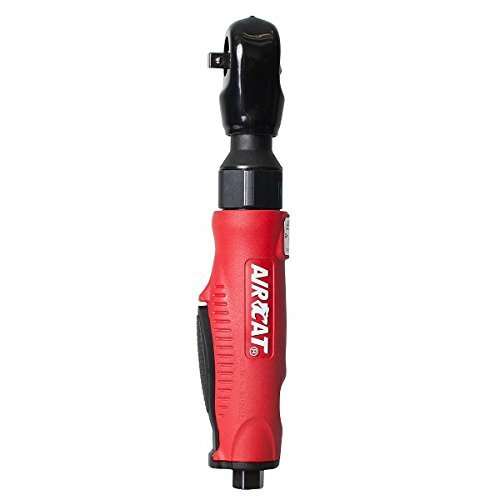 The AIRCAT 802-5 is another affordable air ratchet wrench that does not compromise on functionality. This one here is a very quiet air ratchet wrench that only produces noise levels of up to 84 dBa. The package comes with a ratchet head cover for your convenience and with a ½ inch drive size; you can expect a 70ft-lbs torque from this air ratchet. If you are in search of a comfortable but compact air ratchet, this here might fit your needs. It performs well for most maintenance and repair tasks, plus you get a 2 year warranty which is great. Thanks to the built-in silencing exhaust technology, the noise this wrench produces is minimal, especially when compared to other ratchets. The design and quality is also well suited for professional usage, making it a solid pick for mechanics who handle heavy-duty tasks on a daily basis. With over 100 years of skin in the game, Chicago Pneumatic (also known as CP) is one of the most renowned brands in the manufacturing of power tools. Their Chicago Pneumatic CP886H is iconic for its compact head design that allows for sufficient flexibility at work. If you are working with water pumps and exhaust systems, you will find it handy as it provides easy directional change with its grip and reverse lever. For those looking to work in a quiet workspace with minimal noise, this air ratchet will be a disappointment. It produces noise levels of up to 98.2 dB that would require s earplugs to protect against the noise. However, it’s a no frills type of air ratchet and is made of a durable quality that can be put through the paces and survive. In fact, its slim design makes it easy whenever you need to reach under hard to reach places and its powerful torque provides power sufficient for heavy duty tasks. Air ratchet comes in all shapes and sizes and with a variety of features. Here are a couple of considerations to look out for if you want to pick the best. The drive size matters a lot depending on the size of the bolts you are working with. Most mechanics will recommend a size that extends to 0.11 inch. For most lightweight tasks, ½ inch drive sizes will perform as expected. On the other hand, a 3/8 inch size is more suitable for heavy-duty tasks. Keep in mind that the larger the size the more the torque required. Since air ratchet work with air compressors, it is quite common to bump into a bunch of noisy air ratchets especially with more traditional models. To put it simply, it is practically impossible to keep these tools completely quiet. The reason is that the drill ends up producing most of the noise. For protection, it is recommended that you put on some earplugs especially if you plan to work with an air ratchet in the house. However, there are some air ratchets that only produce 80 dB of noise. Speed is measured in RPM for most air ratchets. It determines the spinning rate of the ratchet hence the force of unscrewing or screwing the bolts. Most air ratchets feature adjustable speed depending on the task at hand. Air ratchets that are capable of higher speeds make the work easier and save time especially while working with long screws and bigger bolts. Almost similar to the speed is the torque of the air ratchet which pretty much determines the power the air ratchet has to handle for the job. With a powerful torque, you can prevent knockback on your knuckles and keep your hands at ease. Apart from only purchasing your air ratchet you might also need an air hose reel and an air compressor to get the most out of your air ratchet. You are going to have to think about the size and portability of the air compressor tank to go for while you are at it. Other air ratchet related features to have in mind include lubrication. The lubrication on your air ratchet will reduce the torque needed to fasten the bolts. Some air ratchets come with some oil to increase lubrication. You can also add your own using white grease oil or graphite. For durability, think about the material that the bolts are made of. Bolts made of bronze and brass usually need more torque power than steel bolts. What are the best brands that produce quality air ratchets? Ingersoll Rand. This company has been around since 1871. It’s an Irish American company with a global presence. With an inclination to create more efficiency while saving time and energy, this company prides itself in creating reliable and durable tools for mechanics and DIYers across the globe. Dewalt. This here is another manufacturer that has been in the tool making industry for close to a centaury which is nothing to sneeze at. It is a company known for its axes; pry bars, pressure washers among other accessories, hand tools and outdoor equipment. Aircat. Although Aircat has only been around for about 30 years, it boasts of a great deal of experience making pneumatic power tools. Most of their air ratchets are known for low noise levels without loosing performance in terms of torque power. The company also boasts of decent ergonomic tools that are comfortable to work with. Chicago Pneumatic. It has been more than 100 years since Chicago Pneumatic was founded. The company is an industrial manufacturer that provides mechanics and DIYers across the globe, quality and durable power tools. Before you go about picking your air ratchet, you need to know a bit about air compressors. You will need an air compressor that has a PSI compatible to that of your air compressor. What is a PSI? Well its simply stands for Pounds per Square Inch. This is the amount of air pressure your tool can handle. By checking to see the PSI level of your air compressor you can determine what air ratchet to buy. Therefore one of the major features to prioritize is the PSI level of your tool in comparison to your air compressor. You also have to think about the torque depending on whether you are handling heavy duty tasks. Keep in mind that an air ratchet is supposed to be boosting your productivity so prioritize the size that fits you well. Also, depending on the bolts you are working with, the size of the air ratchet will matter however most come with sockets that allows you more flexibility. Can I remove suspension bolts and lug nuts with air ratchets? Well the simple answer to that is a definite yes. 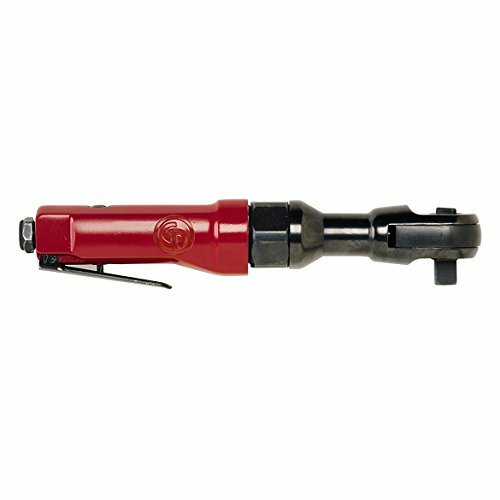 With a high torque air ratchet, you can preety much handle larger bolts in your maintenance projects. In fact most professionals find it easy to work only with air ratchets as opposed to other power tools for the simple reason that air ratchets make the work easier and more enjoyable. However, there is a caveat. The more torque power you require for the job the higher the price you will have to pay. This means you might not be able to handle stuck large bolts with an air ratchet with less torque power. Is an air ratchet a must for repair and maintenance tasks? Let’s face it, even though an air ratchet is all about improving your productivity there are a good number of tasks in your workshop that you might not need to use an air ratchet. However, decent air ratchet can significantly help you go faster on that maintenance task giving you the convenience of spending less time and energy on a project. For mechanics that fasten and unfasten bolts on a regular basis, there is no better investment for saving time than to get a premium quality air ratchet. Well, there you have it. With all the topics we have covered plus our list of the best air ratchets in the market, you are now informed on what to settle for. 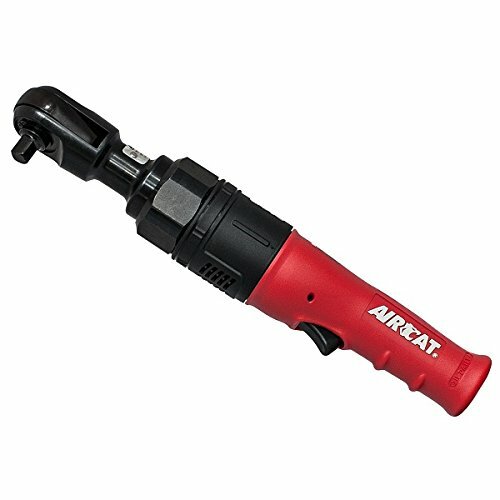 If you need an air ratchet that produces less noise, we recommend you go with AIRCAT 805. For a comfortable grip that allows flexible speed adjusting, we found Ingersoll Rand 170G to be the best option. Be sure to also check out our buyers guide for more tips on installation and use.